Fifth and final part to a sensory series. Read Part 1: How We Smell, Part 2: How We Taste, Part 3: How We Touch, and Part 4: The Flavor of Wine. The sense of sight is completely unnecessary to enjoy wine. This isn’t even a debatable point. One could claim that they derive extraordinary pleasure from looking at the color of the wine and would be at a complete loss without it, but I think we would all just pat them on the shoulder and pity them for their stupid opinions. Perhaps the most important part of sight, when it comes to wine, is locating where your glass is, and how much wine you have left in that glass. The only sense less important to enjoying wine than sight is our sense of hearing. With all the slurping that most wine lovers do, it may in fact be more enjoyable if we could simply turn our ears off and only turn them on for the ensuing conversation. Regardless, wine does have a distinctive color. As I mentioned before, the color of wine can affect our perception of what the flavor of the wine is because we are hard-wired to recognize patterns. Therefore, when conniving researchers intentionally change the color of a wine as a ruse, it can be effective. I have personally found that this is generally more effective when done with those more knowledgeable in wine (Up to a point) than with wine novices. 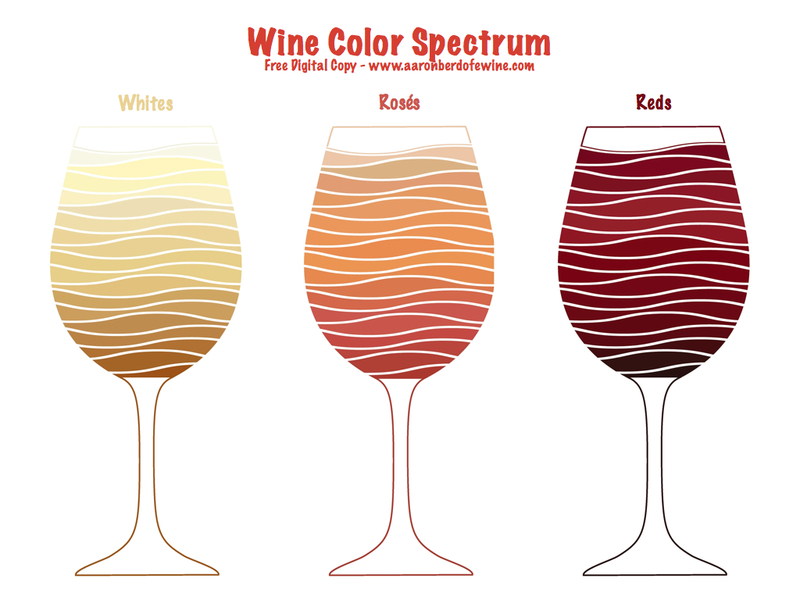 It is certainly true that we can derive information from what the color attributes are of a wine. We can asses how far along the path of maturity (Not necessarily age) a wine is by how much the color pools to the middle. We can assume some oxidization of a white wine if it is tinged brown. This doesn’t mean that we will enjoy a wine more or less based on visual cues, but perhaps we will pick up some indicators about what our mouths and noses will confirm. The most interesting thing about how we see the color of wine is the number of parallels that exist between the sense of sight and how we also smell, taste, and touch. All of these senses are in stereoscope, meaning that while our receptors for a particular sense may be specialized, they are by no means limited to their specialty. In sight, we have 3 receiving cones for red, blue, and green for the light entering them. As will be shown, the wavelengths of light that they receive, actually overlap. It has been since the times of Isaac Newton that we have known that color is not contained within objects, but the objects cleverly reflect only certain light wavelengths. We perceive these electromagnetic waves as color. Perhaps it was to distinguish when berries were ripe or to more easily spot prey or predators, but the Why is not so much important to this article as the How. While I would love to lay around stoned with you and discuss whether the blues I see are really the same blues you see (perhaps while singing the blues), the answer amongst normally functioning humans is that our hardware is generally the same and how our brain interprets these is pretty much identical between us. There are those that have different hardware, and their world of sight is different, but more on that later. The cones are commonly identified by the range of color that they are best at perceiving, but you’ll note that they overlap which means that they are somewhat sensitive to other hues as well. There are a number of interesting things that can be said about the distribution of our cone types and where they actually are positioned in our eyes which are detailed here, but an important thing to note that is despite the inequality of the distribution in types of cones, our ability to see the different hues remains relatively the same. This means that much like how there is a high order of brain processing going on to give us flavor, there is also a high level of processing going on to help us identify color. When there is fault in the development of one or more types of the cones, this results in color-blindness. Tetrachromacy, on the other hand, is a condition where one develops an extra cone which is commonly sensitive to more of the UV spectrum range of light. This is how a number of the animal kingdom sees the world, including butterflies, and there is speculation that Van Gogh was a Tetrachromat given the colors used in his paintings of blue flowers. Regardless, whether you can see color normally or not, it probably will not affect your enjoyment of a wine. Additionally, we also have ~120 million rods that detect the level of intensity of the wavelengths hitting them. This intensity can be thought of as the saturation of a particular hue. The seemingly infinite combination of these gives us all of the colors that we see. The colors of wine though are not infinite. In fact, we generally only speak of whether one is Red, White, or occasionally the blushy mid-point between the two colors called Roses. What we are really referring to is a range of colors that range from golds to clear or almost greens for Whites, Pink hues for the Roses, and light Reds to Purples (Although sometimes Oranges and Browns) for Reds. As you may have now figured out, it generally stands that the darker the color of grape, the darker the color of wine will be. The pigments that create the colors that we see work by absorbing certain wavelengths. Therefore, it stands to reason that the more pigment there is in something, the more intensely colored it will be. In other words, the hue is determined by the make-up of the pigment, and the saturation is determined by how much pigment there actually is. In wine, most evaluations value the correct hue for a wine varietal, meaning the grower of the grape allowed the grapes to ripen until they were just the right color, and the also value the saturation of that color meaning the wine maker was able to extract an appropriate amount of color from the skins of the grapes for Reds and Roses. In judging the color of a wine, it’s not so much verifying that the wine is of a color it should be, a general range is fine. The hue of a wine is inherent in the wine making process unless something really gets screwed up. However, when it comes to the color intensity of the wine, the wine elite seem to generally prefer hues with a higher saturation. This is generally referred to as the brilliance of a wine. A wine that has less pigment extracted from the skins or inherent within the juice may be considered dull. Clarity is a simple matter of how much opaque material is still left in the wine. Winemaking is a reductive process at its most primitive form. After the alcohol is created through fermentation, the winemaker begins the process of slowly stripping out everything from the wine but the water, alcohol, and molecules relating to flavor and color. The remaining solids will just create cloudiness. While it is certainly true that the visual appearance of wine in a glass can give clues to the quality of how the wine was made or perhaps what flavors we are about to experience, there hasn’t been any evidence that shows that it actually affects our enjoyment of the wine. Therefore, as you sip languidly on your next glass, go ahead and close your eyes and let your mind conjure up images based upon the flavor you are experiencing instead.